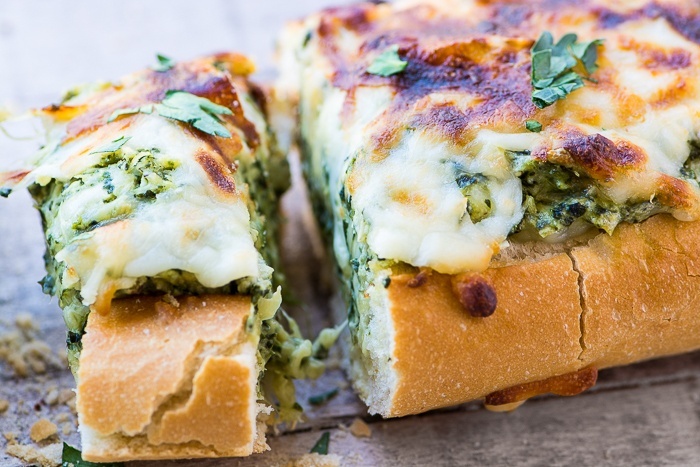 Cheesy Spinach Artichoke Bread is the perfect appetizer package....everybody's favorite garlicky, cheesy dip ready-stuffed into a crunchy baguette. Make sure your spinach is very well drained, I put it in a mesh strainer and push the excess liquid out with the back of a large spoon. Put the spinach and garlic into the bowl of a food processor and process until finely minced. Drain the can of artichoke hearts, and then squeeze the excess liquid out of each one gently by hand. Add them to the processor and process until finely chopped. Add the cream cheese, sour cream, mayo, sharp cheese, and just 1/2 cup of the mozzarella to the processor. (Save the remaining 1/2 cup of mozzarella for the topping.) Add the salt and pepper and process until well blended. Cut a channel into the top of the loaf of bread and remove the top section of the crust. Scoop out enough of the bread to leave room for the dip, but be sure to leave some bread along the bottom and sides for stability. Stuff the dip into the bread, pressing down with a spoon to get it completely filled. You will have extra dip, depending on the size of your loaf. You can bake it separately with chips, or freeze it for later. Bake the bread for 15 minutes. Remove from the oven and sprinkle the remaining mozzarella cheese over the top. Return to the oven for another 15 minutes, or until everything is hot and melted. Sprinkle with chopped fresh parsley. Let the bread cool for a couple of minutes, and then slice. Plan to serve right away, while it is hot.